Summary: As Twitter becomes part of your routine — and especially if you manage multiple accounts — it’s easy to feel as if you’re floundering in the incessant flood of information. But a good Twitter dashboard (sometimes called an application or client) gives you access to your accounts in one place and can help you stay afloat by making it easier to monitor, plan and track updates and conversations. Here we compare our top seven Twitter dashboards, as well as list others that may work best for you and your organization. Compare these to our earlier roundup of Top 10 social media dashboard tools. Twitter dashboards come in two types: desktop and Web-based. Which one best fits your organization depends on your preferences. While some people prefer to separate their Twitter and Internet experiences, other people find it easier to keep everything within the Web browser. One downside of running a separate desktop client is that it can slow down your computer. However, even though Web-based solutions don’t require updates as do desktop ones, they also occasionally don’t work properly. Many of these clients also work on other platforms, including iPhones, Androids, iPads and others. All of these tools can be a bit daunting at first, so expect to spend some time getting familiar with them. 1TweetDeck allows you to schedule tweets, to follow and unfollow accounts, and to create separate columns to track hashtags, keywords and Twitter lists. It also supports Geo-tagged tweets. You can track links using the url shortener bit.ly, and if you feel limited by 140 characters, a service called deck.ly allows you to tweet longer. The pop-up notifications can be helpful if you need to stay updated on a certain topic or keyword throughout the day. Unfortunately, you can’t filter the pop-ups but you can turn them off. On the negative side, this desktop tool has been known to slow some computers down since it uses Adobe AIR. 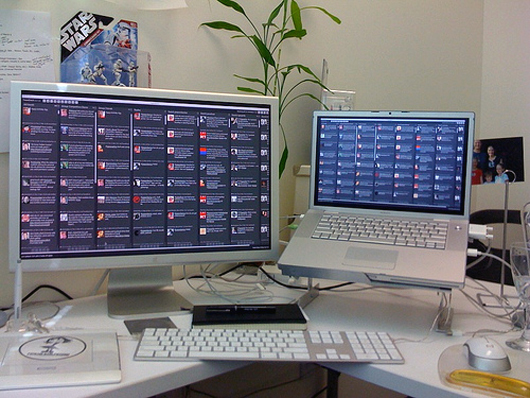 Twitter acquired Tweetdeck in May 2011, and although they have not done so yet, and haven’t shown any signs that they will, some people have concerns that Twitter might shut down Tweetdeck to protect itself. For now, this dashboard also simplifies Facebook, Myspace and Foursquare account management. Plus, its Android app gets the best reviews. 2Like TweetDeck, Hootsuite can also schedule tweets, follow and unfollow people, and create separate tabs for monitoring. This intuitive dashboard has several useful features. First, it is designed to make collaborating and organization easy. Second, it offers free analytics, including a built-in url shortener, which tracks your tweeted links. Other useful features include displaying a user’s Klout score, which measures online influence, and a bookmarklet that allows you to tweet about a page without leaving your current tab. It also supports Facebook, LinkedIn, Ping.fm, WordPress.com, MySpace, Foursquare and mixi. Plus, real-time searches can be embedded on your website. On the downside, this client can fall asleep with inactivity, which disrupts any monitored streams. The free version of this tool provides you with free social analytics, five social profiles and it’s ad-supported. Or you can opt for the $5.99 per month Pro version that allows you to have one team member, plus unlimited social profiles, enhanced analytics, no ads and more. The iPhone app is excellent for tweeting on the go. Hootsuite also continues to improve its service. Three updates announced this month provide geo-analytic technology, deeper integration with LinkedIn and crowd-sourced explanations of trending topics.